How to interpret the insane, colorful, expensive outfits worn as part of Philly’s oldest and weirdest tradition. Jan. 01, 2016, 9:19 a.m. The Mummers Parade is quite possibly Philadelphia’s most visible tradition. Grown men (and a few women) are going to dress in sometimes fantastical garb and strut through the city in their respective groups. Some will have spent thousands of dollars on their costumes. Some will take the judging process of the parade very seriously. Many will be drunk. The colorful, sequin-y and feathered costumes worn by Mummers vary greatly depending on what type we’re talking about. There are six different types. You can find more details here, in our explainer on the Mummers. This new sub-section of Mummers was created to foster more diversity in the yearly parade which has been widely criticized for not only lacking diversity in the past, but for outright denying it. 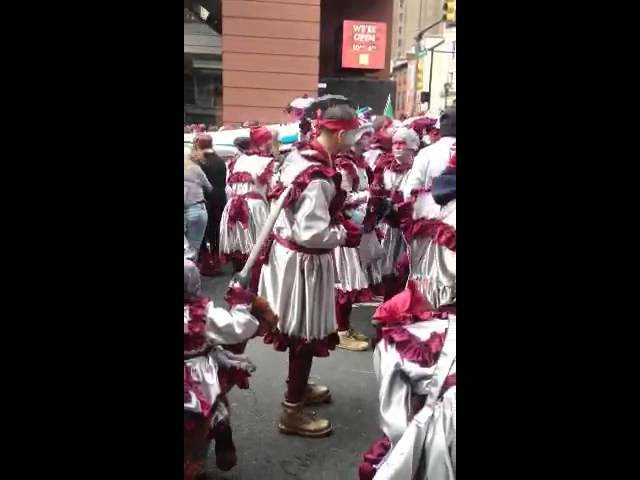 It’s traditionally featured white men of European descent, and controversy comes down almost every year as at least one or two Mummers do something, well, racist. This year’s Philadelphia Division will feature Hispanic performance groups and an African American drill team. We won’t break down their costumes this time around, as the 2016 parade will be their first performances. But look out for these new groups, as they’ll be up first in the parade early in the morning. Just one Fancy Division (different from Fancy Brigades which officially split off in 1978) group remains: Golden Sunrise. The group will strut in the parade following the Philadelphia Division Performances. As the name might suggest, this group is known for its elaborate and often expensive outfits that are much larger than other performance groups. Yes, there is a person in there. Golden Sunrise hasn’t released information about what its theme will be this year. You’ll have to post up on Broad Street to find out. OK, so if you see a bunch of dudes walking (stumbling?) around and they’re all in matching costumes made of satin, you’re probably looking at a Wench Brigade. Each group will have more than 100 members and some will have a live band strutting along with them. Oh, and one of the most important parts of a Wench costume: A beverage. 2. Polish American String Band- The Toys Are Back! The parade will end off with the Fancy Brigades, which are like the Fancy Division but much larger and, you guessed it, even more elaborate. This year their themes range from “A Scarecrow’s Dream” to “Coming to a Theater Near You; Skull Island,” and they’ll perform at the Convention Center. Fancy Brigades feature a captain whose costume can run upwards of tens of thousands of dollars to create. They’re the leaders of the group and often in the middle of the pack during a performance. Sure, the parade is supposed to be the focal point of the Mummers tradition. But the after party on Two Street (2nd Street the rest of the year) in South Philly can be a blast. If you’ve never been, it’s worth checking out. You can’t miss it if you’re on Two Street anywhere south of Washington Ave. by the time it gets dark today.